Recently I lost my father, and going through his things; pictures, documents, items and the like, I became curious about my lineage. So I did what I think most people do, they sign up for ancestry.com. It was amazing, in five hours I had traced my line back to 1508 in Radnorshire and Wales England. Now, I'm not saying its this easy for everyone, I just had one of those trees I guess. Captain James Powell, my thirteenth great grandfather his wife Jane Jones and their son John Powell, my 12th great grandfather settled in first Jamestown and then on the way to Virginia Captain James Powell, died by an attack from a group of Native Americans. I found that I had two uncles and a grandfather who served in the Revolutionary War, three more uncles and a grandfather who served in the War of 1812, and as they settled in the states eventually moving south, found their way to Arkansas, where they served in the Confederacy. I of course jumped at the chance to join. I am still in the process actually. It is a process which involves many records as you can imagine. Of course we all know the legends of Freemasonry in regards to its association with the American Revolution, so of course I though “Is there a Masonic Body of this organization?” And the answer was yes and no. There is a group and they are on Facebook and further, they are called the Mason Sons of the American Revolution. But they are not an official group. Just a bunch of us that are in fact Freemasons as well. If your family has been here a while, it might be worth checking out. There are several ancestry websites which are far less expensive than the one I used, and from what I understand, just as good. Happy hunting everyone! I have a question...Are the Daughters of the American Revolution connected to Freemasonary as well? I'm not so sure either the Sons or Daughters are truly connected, outside that of being clubs with a historical significance within the USA. 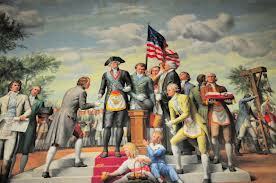 The Sons and Daughters of the American Revolution are not related to Freemasonry. In order to be a member of either group, you have to be able to trace your family lineage back to the American Revolution. I have an aunt that's very involved in the Daughters, and they came and talked to our High 12 Club a couple years ago. They do a lot of good work, but they aren't related to Masonry.